Inside: The best printable 6-month-old baby schedule. Plus, I share tips for teaching your baby the difference between day and night using age-appropriate awake time activities. It was 7:15 in the morning. I rolled over in bed and looked at the baby monitor. I could see my daughter happily playing with the soft books we had in her bed. I walked in her room and gently picked her up for a morning snuggle. This was a typical day for us. I loved being able to predict her schedule. I began implementing a schedule early on for both of my children to teach them the difference between day and night so that they would quickly learn how to sleep through the night. Because babies grow so fast. It can be challenging to keep up with the schedule and routine changes. Every month brings new milestones, feeding times, and nap times. That’s why I am sharing this 6-month-old babywise schedule for parents. It’s is a great resource to compare or predict what your baby might be doing at five or six-months-old. 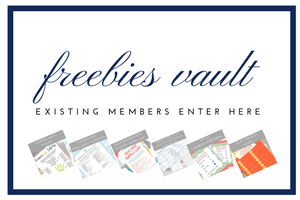 Grab your free baby schedule here. When I mention feeding in the sample schedule, I am talking about the baby drinking milk. Although, you may also be introducing solids at this time in the baby’s life too. That will be something you can insert into the schedule as you and your healthcare provider decide is appropriate for your child. Of course awake time refers to the time the baby should be awake during the daily schedule. I will also provide 6 month old awake time ideas for this time, later in the article. This schedule can be altered to fit your child depending on when your baby typically wakes up. You can get an idea for how long your little one will be awake or asleep following the wake up time. This schedule is made as an outline to follow. It’s equally important to watch and listen to your baby to adjust as necessary. Times may vary by 30-40 minutes on a daily basis. As your baby grows from five months to six months, the awake time may grow also from one hour to 2 hours. You can adjust the schedule based on cues from your baby. If they are rubbing their eyes, getting fussy, crying, or yawning near the sleep time, then they are most likely ready for a nap. 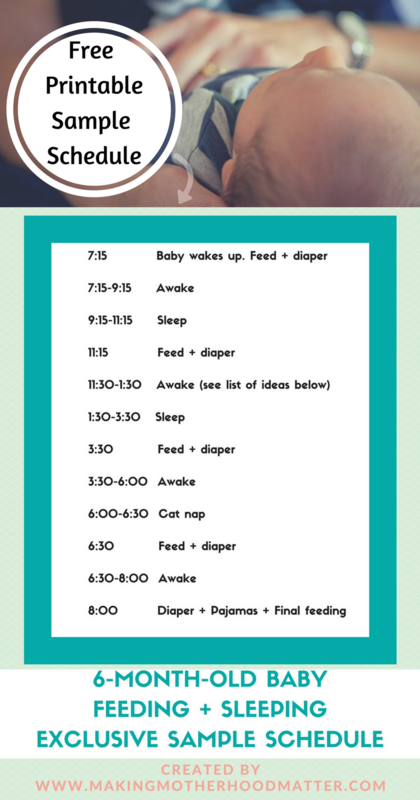 If my baby is going through a growth spurt or I did not get the recommended number of feedings in during the day because of extended naps, then I would cluster feed at night.An example of what this might look like is feeding the baby at 6:00, 7:00, and then the final feeding before bed at 8:00. This ultimate breastfeeding guide is packed with helpful tips for troubleshooting when you are feeding your baby. Get to know your baby’s cues for when they are hungry or sleepy so you can easily adjust the schedule as needed. The overall daily schedule will follow the general flow of eating, being awake, then sleeping, as suggested by this book. It is best to adjust this schedule based on the wake-up time of your baby and his or her hunger and sleep cues. By creating a schedule such as this one, you will be able to predict ideal times for life events like doctor appointments, errands, play dates and more which makes life easier for the parents and the baby. P.S. If you enjoyed this article, you may also like Survival Guide for Sleep Deprived Parents: 7 Strategies to Help Your Baby Sleep Through the Night. Please note that this is for informational purposes only. Please consult your healthcare provider before implementing any changes for your family. I like your awake time ideas, it's a nice addition to just the regular sample schedules. Getting my kid on a schedule was such a nightmare, he was (and sometimes still is) a 45 minute napper. It was always such a pain, plus I could never "sleep when baby sleeps" or really get anything else done! He's turning one in a few days- it seems like yesterday he was 5-6 months.. I miss it!! Hi Kara, I am so glad to hear that you enjoyed the wake time ideas. Both of my children also experienced the 45 minute nap. My daughter got through that stage much faster than my son. I really had to work at limiting sleep aids before my son finally outgrew it. One thing I have learned through all of it is how different every child truly is. Wishing you the best! I used a similar thing with my first born and it worked so well! I was big on creating routine from the get go, I was flexible but liked a bit of structure. My second was a whole different story and wouldn't follow anything! Great ideas as it is so helpful to have some sort of idea of routine and awake time activities. This is very beneficial. Thanks, Suzy. Yes, my second child has learned to be a lot more flexible from the beginning. I guess it comes with the territory.